Are you an established professional who wants to make positive change in your community and the world? Our club members are dedicated people who share a passion for community service and friendship. Becoming a Rotarian connects you with a diverse group who share your drive to give back. What are you waiting for? Come join us for a meeting and see how you can help make a difference. 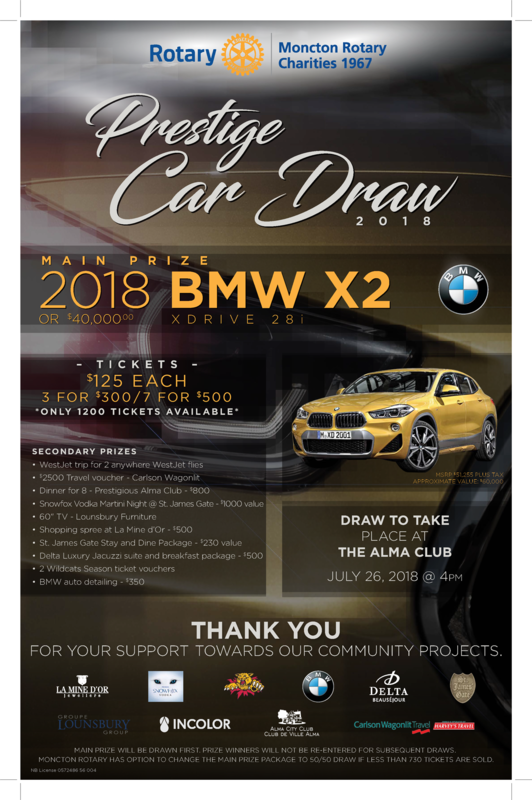 We are pleased to announce that this year's Prestige Car Draw was another success with a total of 965 tickets sold! The winning tickets were drawn at 4:30 pm today at the Alma City Club by Mel Kennah, executive director of Youth Impact Jeunesse, one of the organizations the Rotary Club of Moncton supports in the Greater Moncton Area with the funds it raises. Congratulations to Grand Prize Winner Trevor Ritchie! Congratulations to all our winners and a big THANK YOU to everyone who supported this fundraiser by buying tickets, selling tickets, volunteering time and talent, and providing or soliciting the numerous quality prizes. Every little bit truly makes a difference for Rotary and for our club and for our community. We meet most Monday's for lunch at 12:15 p.m.
Rotary brings together a global network of volunteer leaders who dedicate their time and talent to tackle the world's most pressing humanitarian challenges. Rotary connects 1.2 million members from more than 200 countries and geographical areas. Their work impacts lives at both the local and international levels.